Fuel level sensors are the accurate fuel level instruments designed to measure fuel level in the storage tank or in the fuel tank of the vehicle. The sensors are connected to the telematics terminal and provide the fuel level values. 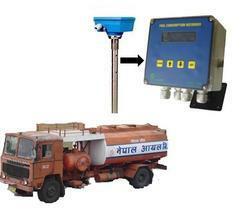 All fuel level sensors are accurate and stable in performing fuel level data. These sensors operate within wide temperature range from -40 to 60 C degrees and bear reliable circuit protection. Range of in accuracy is /-1%. Fuel level sensors are subject to One years limited warranty. Capacitance Level Transmitter is a compact, low cost, level transmitter with 4-20 mA analogue out-put designed to measure the level of various liquids, and solid in tanks or storage vessels. Measuring range is 0.25 to 3 m for rod probe version. The probe forms an electrical capacitor with the surrounding metal contained wall, or with auxiliary reference probe . With the vessel empty, an initial capacitance exists between the electrode And the metal well or the auxiliary reference probe. When the probe become covered with material to be measured the capacitance will increase and the change will be measured and covered into an analogue (4-20 mA) output signal proportional to the change. Rod or flexible cable can be used for various conductive or non-conductive Liquids. Capacitance type microcontroller based Level Indicator Transmitter, series 100 CLT, can be used in a variety of applications for continuous level indication in non fuming conductive liquids with low or medium viscosity like water, water bound solutions. The same unit can also be used for non conductive liquids like mineral oils, turbine oils, cooling oils etc. The model 100 CLT is available as an Integral system, where the electronic insert can either be mounted on the top of the electrode and also as Remote system where electronic insert can be mounted separately near the tank. Level to volume conversion with strap. Wide range electrodes to suit various duties. Possibility of calibration and programming in sealed condition of the unit. On site calibration. Calibration methods from 2 point calibration to multi-point calibration (up to 10 point.). Conductive material : Water based solutions. Acids, Bases etc, only insulated probe are suggested. 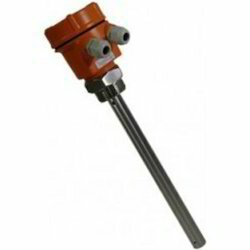 Non- ConductIve matérial : Mostly petrochemical and solvents,Insulated or non-insulated probes can be used. Fuel Level Sensors are capacitive level measurement sensors. Compared with the standard resistive type fuel sensors the capacitive sensors are completely electronically operated and bear no moving parts, ensuring low inaccuracy, stability and reliability in operation. In contrary to the fuel flow meters, the capacitive level sensors are not embedded into the fuel line and do not affect the engine operation. With the help of Capacitive sensors can be accurately determine the time and the amount of refueling and drains, which is impossible with the fuel flow sensors. No moving parts to jam, break or wear out. Sensors built to match your requirements - whether a length adjustment..
Fast turnaround time, even for bespoke sensors. 1-5V / 4-20mA / RS485 analogue output compatible with most systems. On-board electronics - no bulky remote electronics required. Flameproof, IP-65, IIA, IIB, CMRI Certified. Temperature 0 to 55º C / Humidity 5 to 95% non-condensing.